Pinehurst Farm is located in Daleville, IN. The land is classified as a Hoosier Homestead Farm, being owned by the same family for over 150 years. Most recently, the farm was operated as a dairy—the last of the Milking Shorthorn herd left the farm about 12 years ago. 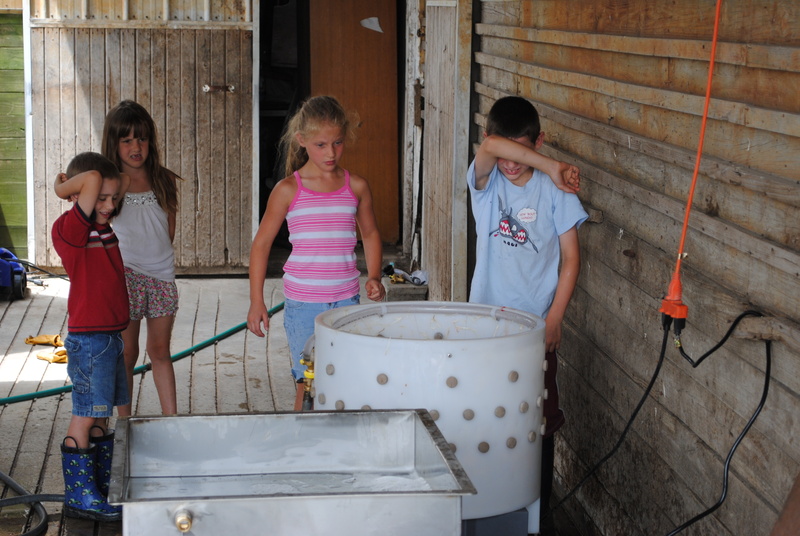 Michael, Sara, Owen, and Aidan moved to the farm, joining Sara’s parents on the property, late last year. We have started small this year, producing “organic” (non-certified) vegetables on 1/4 acre, and raising layers and broilers on pasture. Sales are primarily direct-to-consumer, on-farm sales, but we also sell vegetables at the Downtown Farmstand (www.downtownfarmstand.com) in Muncie, and occasionally set up at the Yorktown Farmers’ Market. 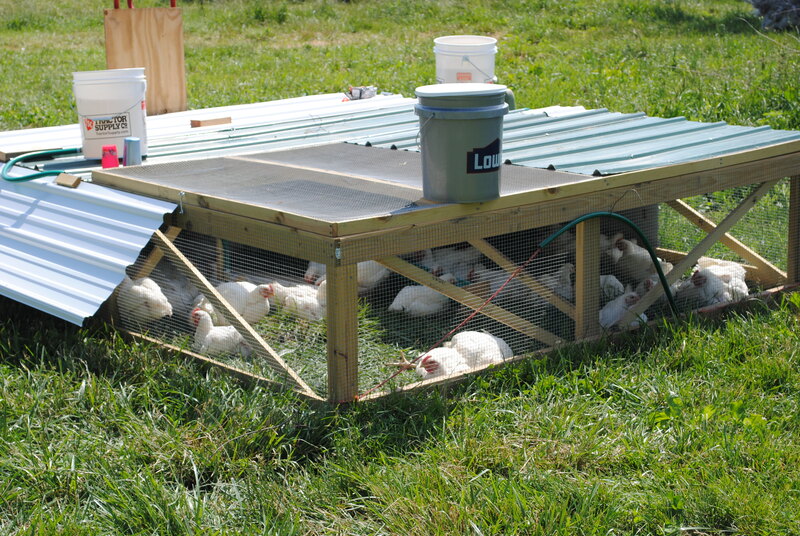 Today, we’d like to share our experience of raising our first batch of broilers at Pinehurst Farm. 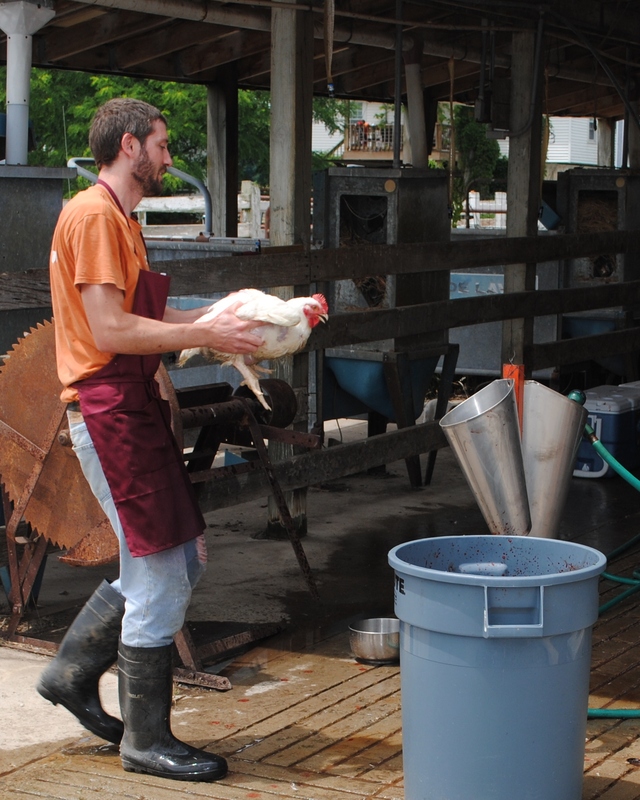 Michael gained experience raising pastured poultry while employed at Lone Pine Farms, Moody Meats in Montgomery County, IN (www.moodymeats.com). He was involved with all aspects of the operation from producing grains, grinding and mixing feed, raising birds from day-old chicks to harvest, slaughtering and retailing the birds through Moody Meats’ own butcher shops. 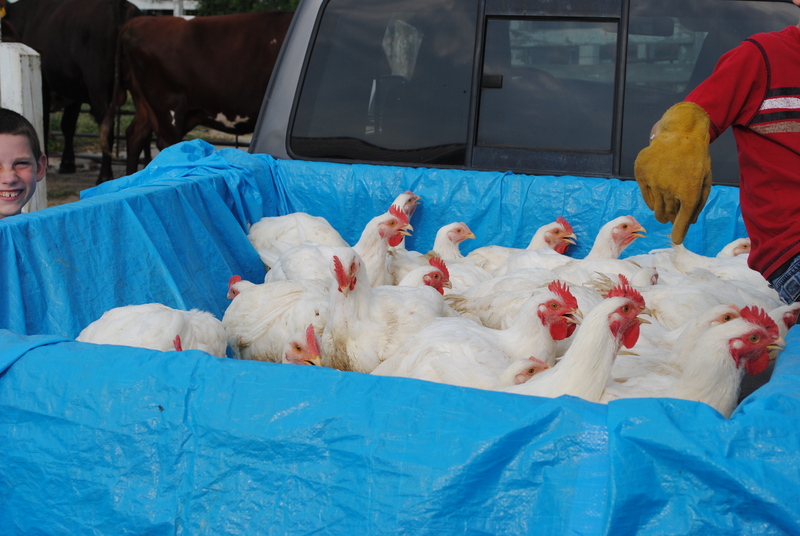 So, with some experience on our side, we purchased a small batch (50) of Cornish Rock broilers. The Cornish Rocks were hatched on April 18, and harvested on June 17 at 8 ½ weeks old. They were raised in a secure, yet well-ventilated brooder from arrival through just under 4 weeks. The birds are bedded on ground corn-cob, given a high-protein feed, free of animal products and antibiotics, and plenty of fresh water. Temperature is maintained with a series of heat lamps in an old aluminum/steel hoover monitored with a remote thermometer. Sounds fancy, but it’s really a very simple setup. The birds lived out the second half of their lives in a Salatin-style pen. A bit overdone, but we used a lot of materials found around the farm. The birds were moved daily from week 4 through 6, and twice daily from week 7 through harvest. Aside from forage, the birds were given the same high-protein grain ration mentioned above. They were switched to a lower-protein ration during the final week or so of their lives. (We are currently looking to source a custom poultry feed made with non-GMO grains – unfortunately, the only source we’ve been able to identify is nearly on the other side of the state). Now, onto the actual harvest day. Here are the birds loaded up and ready to go. These Cornish don’t care too much to fly, so we just loaded them in the back of the pickup truck. The home slaughter facility was setup outside in the dairy barn holding pen. It’s a nice sloped concrete slab with a high roof. Very nice ventilation and shade, access to cold and hot water, and electricity. Here’s Michael taking a mini-turkey-sized roaster to the kill cone. A somewhat rickety kill cone setup—something that will be upgraded for our next harvest. After the bird bleeds out, and the head is removed, the bird is given a quick warm-water wash. Removing some of the “debris” from the bird before scalding keeps the scalding water cleaner for a longer period of time. Since we didn’t take advantage of the continuous fill/drain setup on the scalder, it was best to keep as much grim out in the first place. The next picture shows Michael doing bicep curls with two birds into the scalder. The water is held between 145-150F. We repeatedly dunk approximately 8 times over a period of 45-60 seconds. Next, the birds move to the plucker barrel. 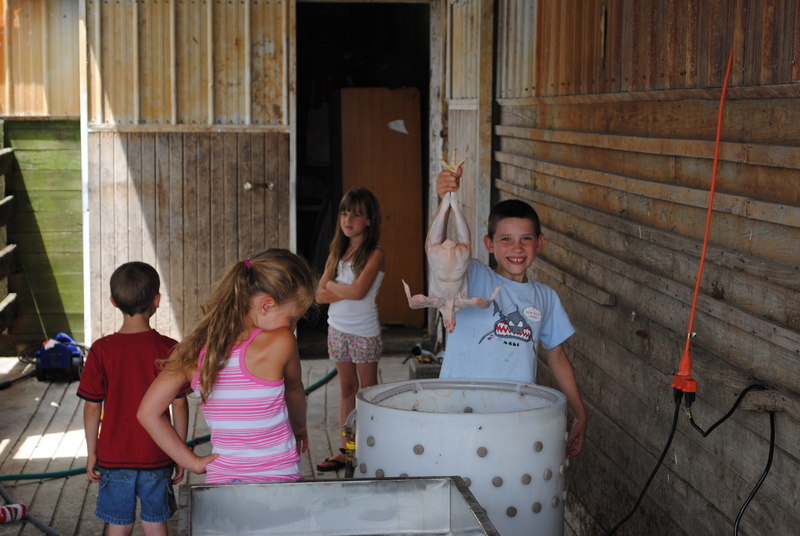 The kids (our sons and two nieces) are receiving a nice education in where their food comes from, at least when it comes from the farm….. Owen is excited by the nicely plucked bird! (Both the scalder and plucker barrel were sourced from Featherman. We give very high marks for their customer service). Then comes the fun part—evisceration! 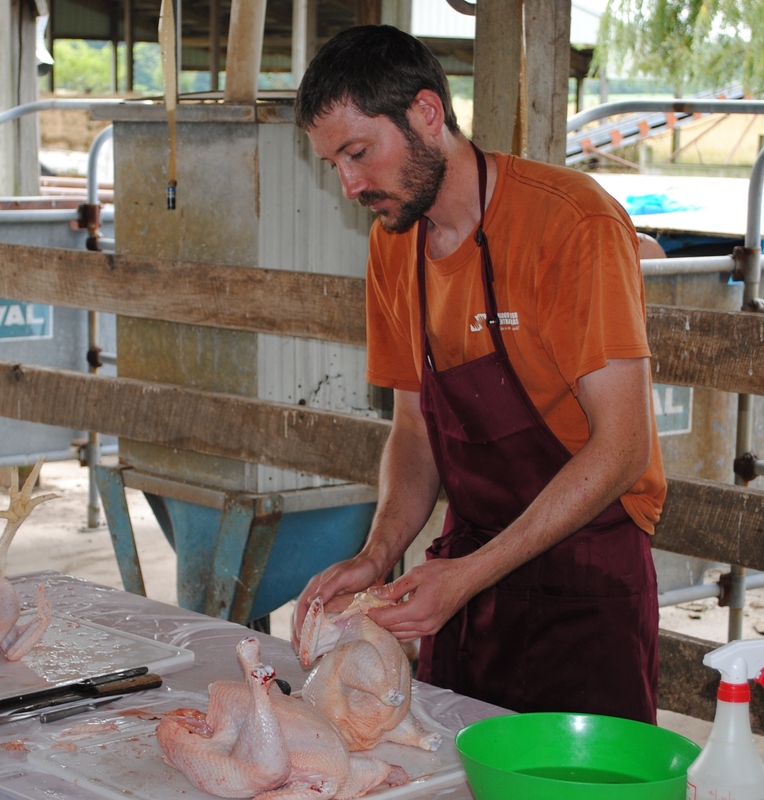 Cut off the feet at the joint and the wing tips; work all the interesting parts around the neck and upper breast; knife around the vent and remove the offal; give it a good rinse and once over. Finally, the nicely dressed bird goes into the cold water bath. The fully-dressed, whole birds weighed from just under 5 lbs up to 7 lbs. Quite amazing how these birds performed in somewhat dry conditions, and at times, very hot conditions. Compared to previous experiences with raising Cornish Rocks, Michael was happy with how healthy and strong these birds remained throughout their short, but very useful, lives. 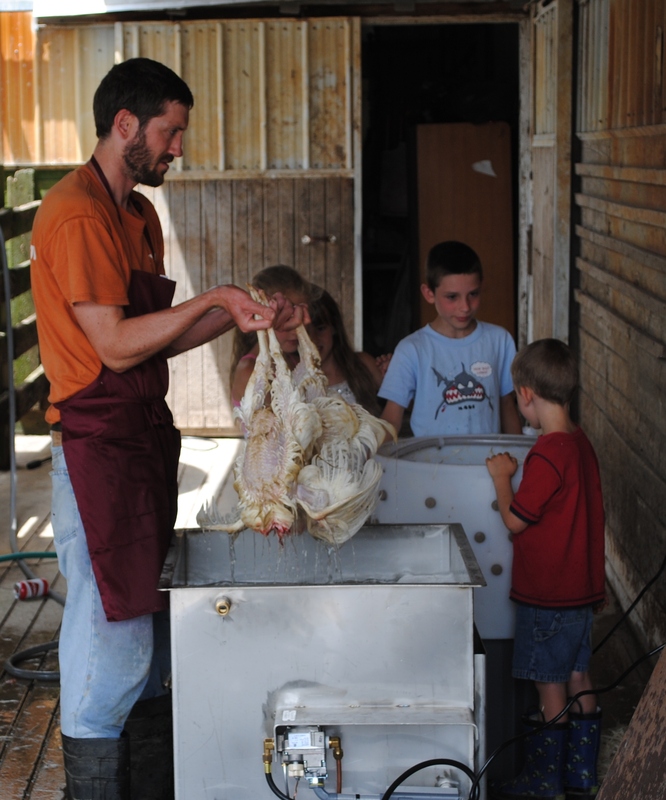 Pinehurst Farm will be harvesting another batch of broilers (Red Rangers) in about 2-3 weeks. It has been extremely hot (over 100F at times) and dry (3/4” since about May 8), and the birds have been struggling from time to time. We have made modifications to their pen, allowing for more room, air circulation, and water access. Time will tell how this record-setting heat wave (and perhaps record-setting drought) will impact the final product. Thanks for your interest in Pinehurst Farm!